We’re rolling out one last recipe from the 21 Day Vegetarian Reset before hopping back into our usual routine next week of exploring ingredients, starting with ***drumroll*** COCOA! Ah, I’m so excited. But first, let’s get our health thing on. 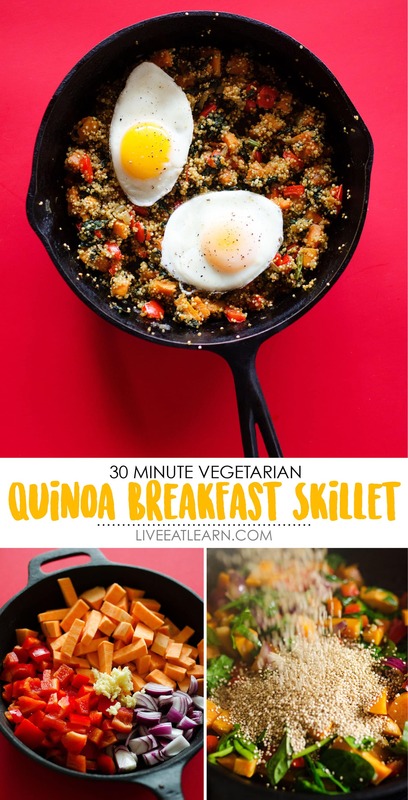 This Quinoa Breakfast Skillet is seriously loaded with veggies. You basically just cook them until soft then add quinoa and vegetable broth and cook until the broth is absorbed. So easy! I’ll be back next week with stories and recipe inspiration from a weekend spent skiing in Switzerland, but for now I must go pack up all my fluffy socks, long johns, and five hours worth of car snacks. Have a great weekend! Heat oil in a large skillet over medium heat. 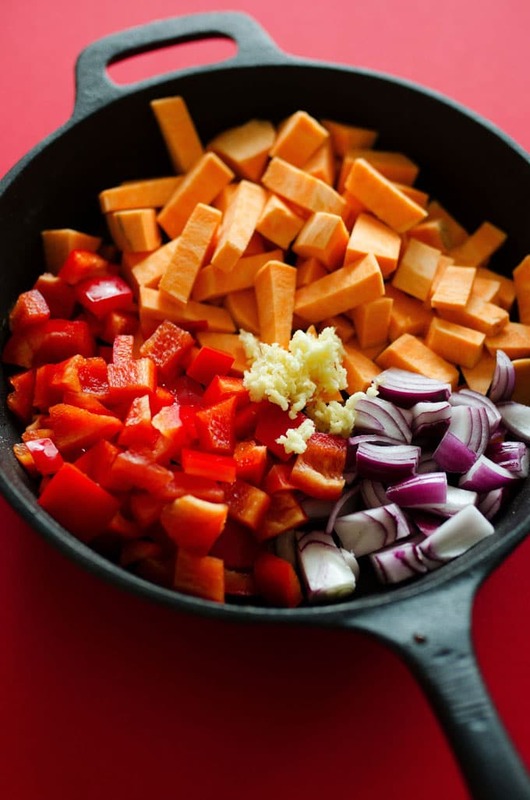 Add sweet potato, shallots, bell pepper, and garlic, tossing to coat. Cover and cook for 10 minutes, or until potatoes are soft. 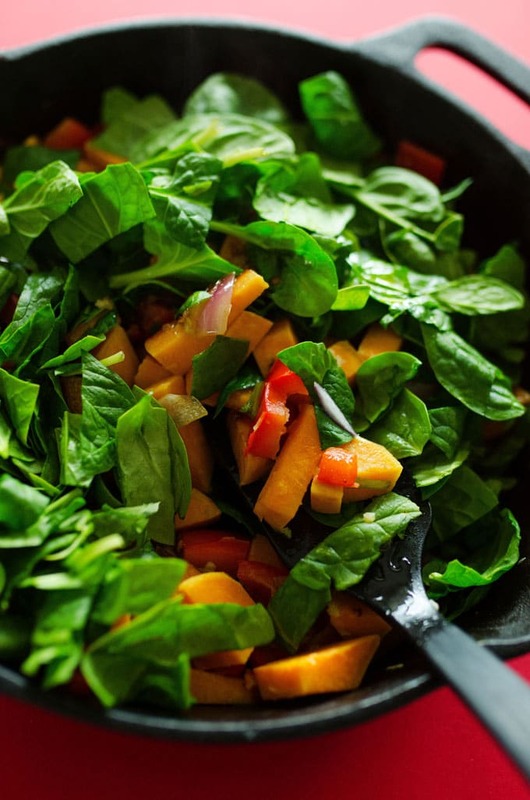 Add spinach, stir, and cook until wilted down, just a minute or two. 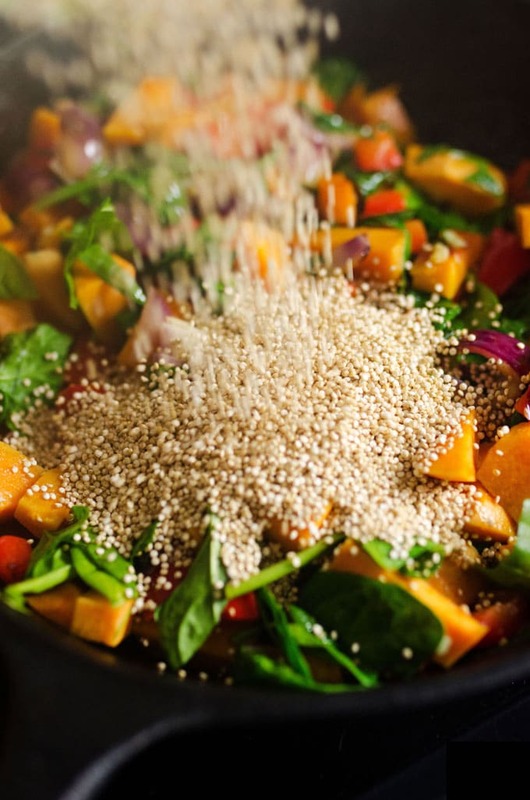 Stir in quinoa, pour in broth, and bring to a simmer. Cover and cook for 10 to 15 minutes until quinoa is cooked. 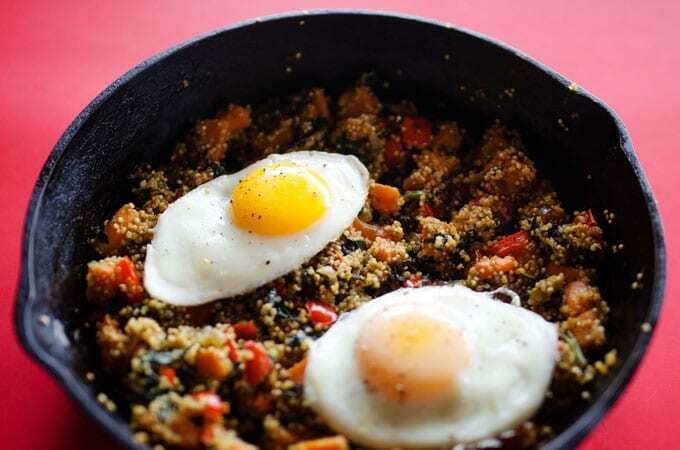 While quinoa cooks, cook your eggs. 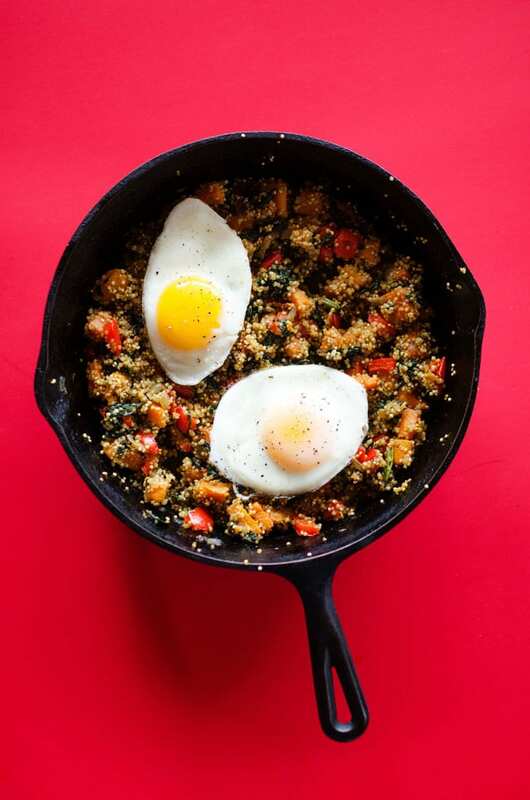 Serve quinoa skillet topped with eggs and sprinkled with salt and pepper. 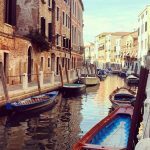 This post contains affiliate links, which means if you buy something from that link I may earn a commission, at no extra cost to you. 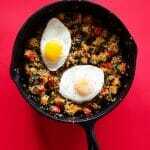 Thanks for supporting Live Eat Learn and for making recipes like this Quinoa Breakfast Skillet possible! 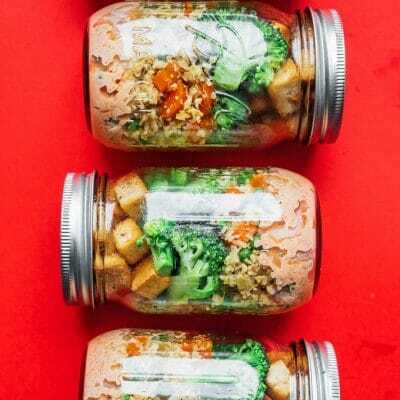 This was a nice recipe, but I think it would be much easier to just add cooked quinoa to the dish at the end, rather than adding it in dry with veg broth. It just added too much time, and the quinoa didn’t really cook well when I did it. Otherwise, lovely dish! Love sweet potato recipes! And yours sounds yummy, thanks! But don’t love bell peppers. 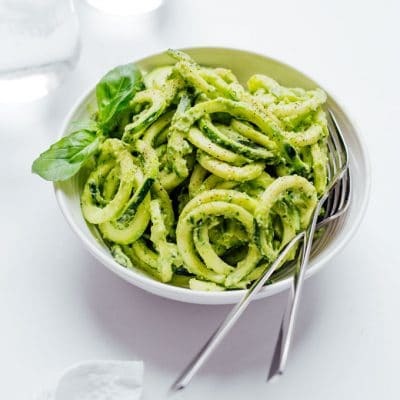 Could you recommend a substitute for the bell pepper? Thx! does this mean only the sweet potato’s in the produce . or can you use the ones in the can? Hi Mary! I haven’t tried this with canned sweet potato before.It might get a little too mushy, so I would recommend adding it later into cooking. Would love to know how it goes if you try it out!